Sheffield based Ward Hi-Tech tasked Constellation Lighting with replacing the current 400W fittings with a low energy LED option, whilst also increasing light levels to provide a WOW factor for customers entering the showroom. At 9meters high with 9meter spacing this was quite a challenge to create an even light across the showroom. Especially after previous LED companies stated that it could not be done without increasing the number of fittings. After conducting a lighting survey, Constellation Lighting created lighting plans to determine which light would meet all of Ward Hi-Tech’s requirements. These results showed that the Delta range would be ideal fitting to create an even light over 9meter gaps whilst also increasing light levels throughout. A combination of 100Watt Delta 48’s and 150Watt Delta 72’s were the lights recommended, providing 400LUX in the main areas. By installing the Delta range there was an immediate saving of 73%, reducing the consumption down from 9KW to 2.4KW. Due to the Delta range’s expected life span of up to 100,000 hours and 3 year warranty Ward Hi-Tech also have the additional saving from reduced maintenance. Maintenance was especially a challenge in Ward Hi-Tech’s showroom due to the large CNC Machines making access particularly difficult. 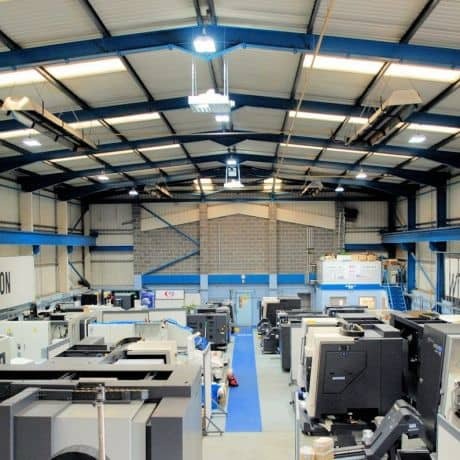 All the staff working in the showroom are impressed with the light output and how much it has improved their visibility when working on intricate machines. Unfortunately Constellation Lighting hasn’t been able to keep everyone happy however. The floor cleaner now has to work twice as hard to keep the floor looking immaculate due to the new high quality light showing up all the marks.